What are you serving for Hanukkah? Chicken and apples is one traditional meal that makes its way to the tables of many Hanukkah celebrations. This one-pan recipe is easy to prepare and cook in less than 20 minutes, making it perfect for the busy holiday or any time for a healthy meal. * Fuji, Gala, Honeycrisp or Rome apples work well in this recipe. In a large sauté pan, heat butter and oil over medium-high heat. Add onion and apple slices and sauté for 3-4 minutes (depends on the thickness), until softened and slightly browned. Meanwhile, season the chicken strips with 2 teaspoons of rosemary, salt and black pepper. Push the onion and apple slices to the sides of the pan and add chicken breast strips to the middle. Brown on both sides, about 5-6 minutes total. (If your pan is too crowded, do this in batches – or remove the onions and apples – so you can properly brown the chicken. Add apple cider vinegar and the onions and apples (if you removed them) and remaining teaspoon of rosemary. Cover the pan, reduce the heat to medium and cook until chicken is cooked through. Serve chicken and apples with extra pan juices. Nutritional information (per 4 ounce serving): Calories 245, Fat 5g, Carbohydrate 9g, Sodium 220mg, Protein 39g. Amy Kimberlain is a registered dietitian and certified diabetes educator with Community Health at Baptist Health South Florida. 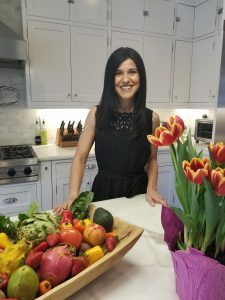 She has 20 years of experience in nutrition and dietetics. Active in the community, Amy has contributed her expertise to various public health initiatives, including childhood obesity, diabetes and family health. Amy earned bachelor’s degrees in nutrition and spanish from Florida State University. She is also an avid runner and Registered Yoga Teacher.